The night temperature across Kashmir Valley and Ladakh region improved by several degrees last night and in Jammu region, the night temperature showed a marked improvement. Srinagar: A day after clocking the lowest minimum temperature in a decade, mercury across Kashmir division, including Ladakh region, rose by several degrees due to overcast conditions. The night temperature across Kashmir Valley and Ladakh region improved by several degrees last night due to cloudy skies, an official of the Meteorological Department here said. In Jammu region, the night temperature also showed a marked improvement even as the weatherman forecast light snowfall in the higher reaches in the next 24 hours. The official said mercury, at most places in the valley, settled above the freezing point, providing residents some relief from the cold. 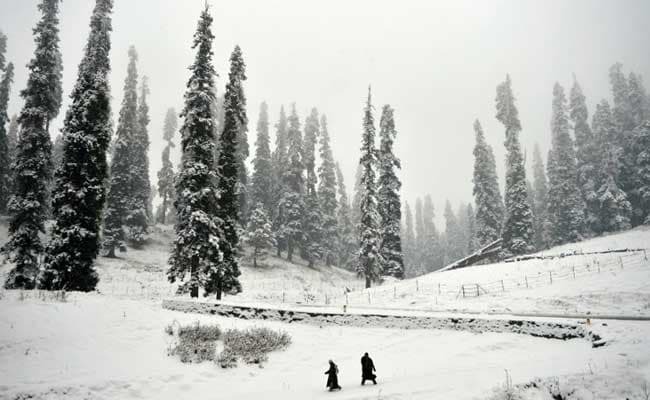 The twin resorts of Gulmarg and Pahalgam were the only places in the valley which witnessed sub-zero temperature. The official said Gulmarg, the famous ski-resort in north Kashmir, recorded a low of minus 2.4 degrees Celsius, up nearly four degrees. The famous health resort of Pahalgam, one of the base camps for the annual Amarnath Yatra, registered the minimum of minus 0.2 degree Celsius, up by over five degrees from the previous night's minus 5.4 degrees Celsius. Srinagar, the summer capital of Jammu and Kashmir, recorded the minimum temperature of 1.3 degrees Celsius, up by over four degrees from previous night's minus 3.1 degrees Celsius, the official said. On the previous night, the city had experienced the lowest night temperature during past 10 years in the month of November. The night temperature in Srinagar last night remained above the freezing point for the first time after four days. The mercury in Qazigund and Kokernag towns in south Kashmir settled at a low of 0.2 degree Celsius and 1.2 degrees Celsius respectively, he said. Kupwara town in north Kashmir registered a low of 0.1 degree Celsius while Leh, in Ladakh region, recorded a low of minus 10.6 degrees Celsiu, an increase of over two notches, the official said. The minimum temperature in the nearby Kargil town settled at a low of minus 5.4 degrees Celsius, up nearly four degrees, the official said. The MeT Department has forecast light rains or snowfall at isolated places in the state over few days from today. The minimum temperature in Jammu settled at 8.2 degrees Celsius. Mercury in Banihal, the gateway town to Jammu region, rose by almost four notches to settle at 7 degrees Celsius. The nearby Batote town recorded a low of 7.1 degrees while Katra town, which serves as the base camp for the pilgrims visiting Vaishno Devi Shrine, recorded a low of 9.9 degrees.